Before your lesson, make a sample craft from the patterns below, but do not glue Moses in the basket. Hold the basket and Moses visuals in your Bible until the story time. Also print the patterns for each child in your class. During the lesson, ask the children to name people who help take care of them. Then say, "I’m glad God planned for people to care for us. Let’s listen quietly to a Bible story about a boy whose mother loved him very much. This is a true story from God's Word, the Bible." 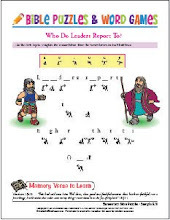 Hold your open Bible as you tell the story of baby Moses from Exodus 2:1-10. Hold up the baby Moses figure when you mention Moses. Hold up the basket when you mention how Jochebed made it. Then place Moses in the basket when you get to that point in the story. 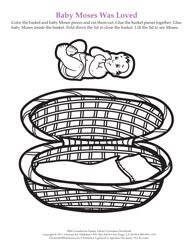 Open the basket (or have a a child open it) when you tell how Pharaoh's daughter found Moses in the basket. Click on the image above to download the craft. Where is the craft? I clicked the link and it took me to a "for sale" type website. Sorry, Trudi, the website is no longer up because the company went out of business :-( I used to manage their blog.